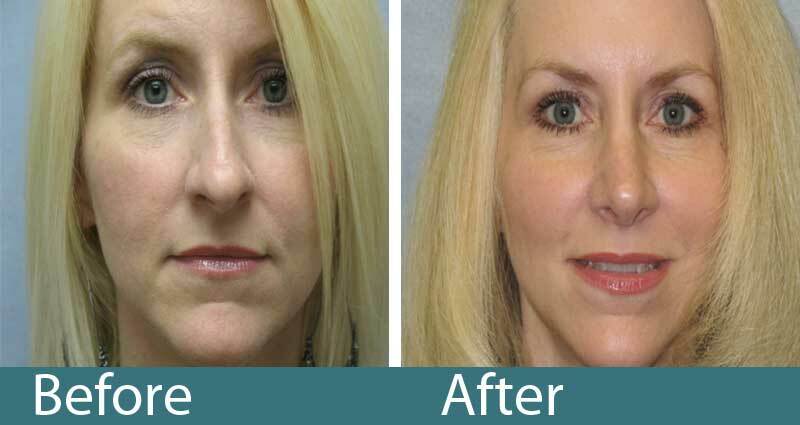 The physicians at Raleigh Plastic Surgery Center specialize in Rhinoplasty and Nose Reshaping Surgery in Raleigh, Cary and surrounding areas of North Carolina. Rhinoplasty, also known as a nose job or nose reshaping surgery, is a term utilized to define surgical correction of deformities of the nose which patients find unappealing. Most commonly it involves some degree of reduction of the nasal hump and correction of deformities of the nasal tip. 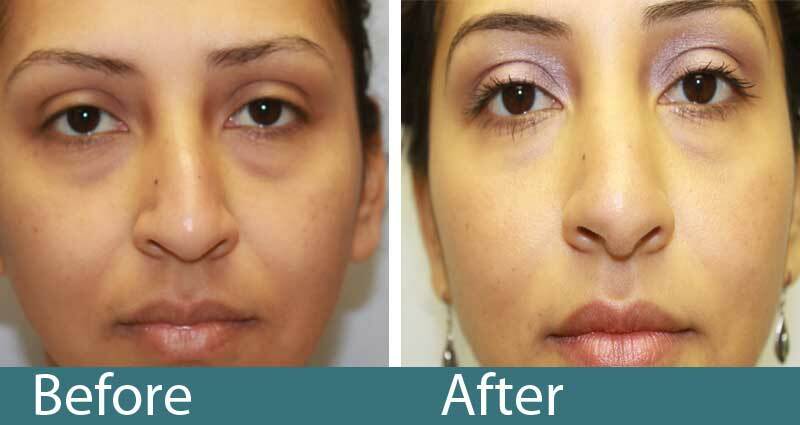 Frequently, it is use to reduce the size of large or bulbous nose. Sometimes these procedures are done in isolation if the tip only or the hump only is of concern. More frequently, a balanced nose is best obtained by including all components of bone and cartilage manipulation. Rhinoplasty can be quite complex and has potential for affecting your breathing. In some cases, if patients have breathing difficulties, correction of septal deformities can be performed. In contrast, sometimes rhinoplasties can cause breathing difficulties. Rhinoplasty surgery has a fairly high revision rate because they are very complicated and complex procedures and patients have a high demand for outcomes. Even in the best of hands, Rhinoplasty may require a minor or major correction after a year or two. 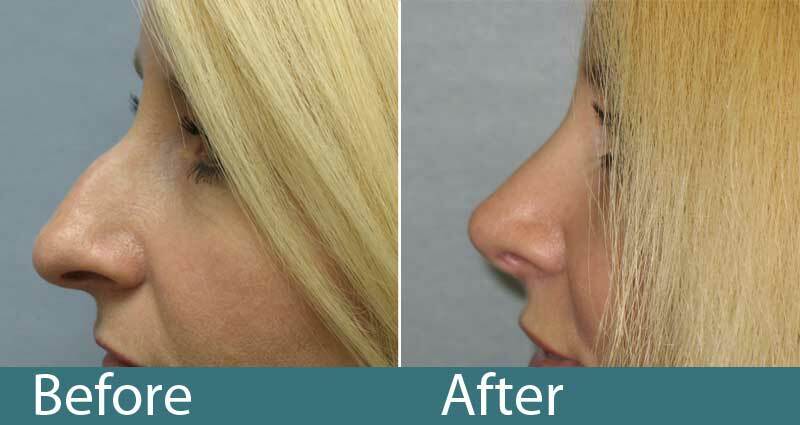 See Rhinoplasty before and after photos. 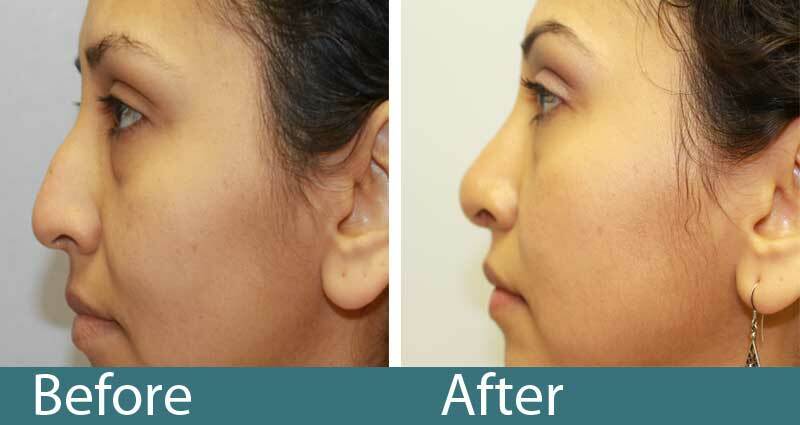 This 38 year old woman displeased with her dorsal hump , achieved correction with open tip rhinoplasty. This 34 year old sought a slightly smaller nasal profile with open tip rhinoplasty. We perform Rhinoplasty surgery at our surgical center usually under a general anesthetic under the care of our board certified anesthesiologist in our AAAHC certified operating suite. Access to the deformities of overly large nasal bones and excess of cartilages can be obtained through internal nasal incisions and usually a small incision across the base of the nose which heals almost imperceptibly. Surgical maneuvers include removal of excess bone and cartilage of the nasal hump, sometimes controlled fracturing of the nasal bones to narrow the bridge of the nose, and either removal and/or suturing to reshape the lower nasal cartilages. These procedures can take from 2 hours to 3 hours and are done as an outpatient. Generally it takes approximately a week to 2 weeks to recover from nasal surgery, at least to the point of returning to most daily functions on a limited basis. Many times, nasal packing is utilized and stays in from 2-3 days to control bleeding from the internal nasal incisions. Frequently, a nasal splint is necessary for a week to protect and shape the newly treated nasal bones and cartilage. Swelling and some bruising are frequently noted. Pain is not a major problem but most patients have a degree of discomfort and require narcotic pain medicine. Long-term results are not completely apparent until 6-9 months when swelling subsides and small shape changes occur gradually. Postoperative visits for suture removal occur at about 1 week with visits spaced out every 4 -6 weeks afterwards for a few months. Q: Does insurance pay for rhinoplasty? A: Insurance only will cover breathing difficulties related to deviations in the septum or bone that inpair breathing. Most commonly, documentation of sinus problems by an independent physician are required for approval. Sometimes, the functional part of the procedure is covered and you may have to pay extra to have the cosmetic part performed, but, they can be done together.